“ONCE UPON A TIME” is still one of the most guaranteed attention-getting phrases in our language. About storytelling is crammed with hints on developing stories. The book contains information on how to find and adapt stories, business matters, and dealing with disasters. It includes a comprehensive resource list. Body language. eye contact, natural pace and intonation are some of the storyteller’s tools. Storytelling crosses all boundaries of age and culture. Stories entertain, inspire, instruct and heal. They’re as relevant now as ever. Some call it painting pictures with words… creating pictures in the minds of listeners. It is the oldest form of publishing. This is a book for all storytellers, parents and grand-parents, librarians, therapists, teachers and speakers. Whether you’re storytelling for fun or a fee, the practical hints will enhance your performance. 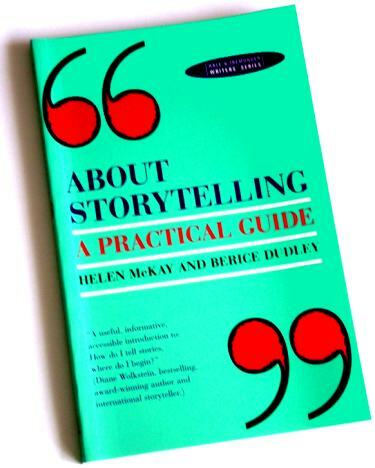 Helen McKay and Berice Dudley are skilled communicators and experienced storytellers. They have shared their collective knowledge to help you learn more about storytelling. $15.95 Special price for revised edition – don’t miss out!